I spent the last week of May doing something very cool: volunteering at the World Science Festival. And by “cool” I mean getting up close and personal with squid guts. 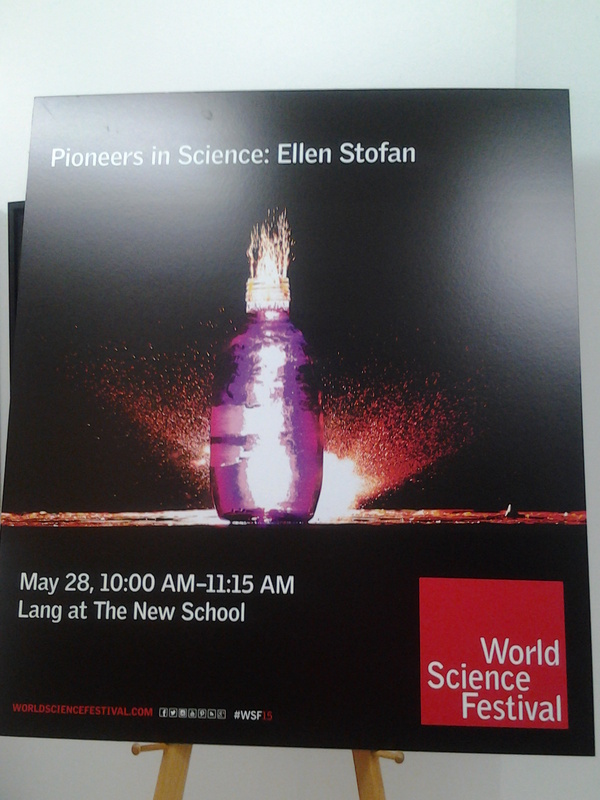 First up was a lecture by Ellen Stofan, NASA Chief Scientist. Did you know that the Chief Scientist at NASA is a woman? Neither did I. In one way I think that’s terrific; in another way I hope we’re getting past the “oh my gosh it’s a woman” phase and can just focus on her long fascination with space and science. We have something in common, Dr. Stofan and me: we inherited our interest in science from our parents. In Stofan’s case it was her father, who worked for NASA during its early days; in my case it was my Mom, who was fascinated by the space program and watched every liftoff and splashdown on TV. To me it was as natural as watching a favorite TV series or sports team. In third grade our teacher thought it would be a good idea to watch an early (pre-moon landing) Apollo liftoff during class time. When a boy in my class expressed amazement at watching a liftoff for the first time, I replied, “But they’re on all the time!” In my house, they were; not everyone had the same experience.